PITTSBURGH, Pa. (July 21, 2018) - For the fourth time in five events, Aaron Reutzel earned his way to Arctic Cat All Star Circuit of Champions presented by Mobil 1 victory lane, this time by taming “Dirt’s Monster Half-Mile” at Pittsburgh’s Pennsylvania Motor Speedway (PPMS) during the second and final leg of the 2018 I-79 Summer Shootout. 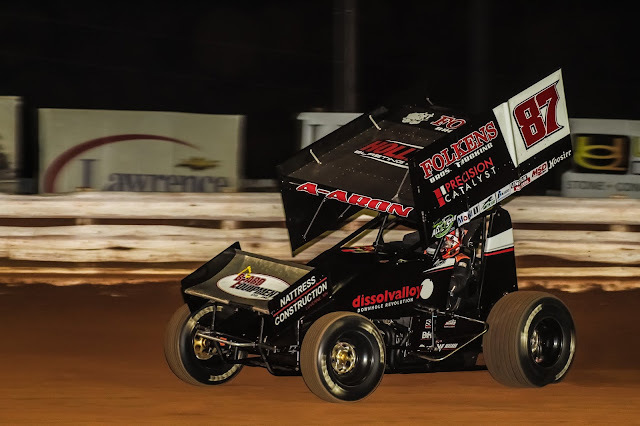 For Reutzel, his evening in Western Pennsylvania was nearly flawless, not only leading all 25 laps of the All Star main event, but also kicking-off the evening with the fastest time during qualifying time trials, as well as earning an impressive heat race win. The victory, Reutzel’s seventh of the 2018 All Star Circuit of Champions season, concluded a model weekend for the Clute, Texas, native that also included a victory on Friday night at Eriez Speedway. Reutzel is now the owner of two perfect weekends in 2018, actually winning back-to-back events at Plymouth (Ind.) Speedway and Dirt Oval (Ill.) at Route 66 on June 29 & 30. After finishing second during the evening’s dash, his only defeat at PPMS, Aaron Reutzel lined up on the outside of row one for the start of the 25-lap main event. Although flawless for most of the program, immediately gaining the lead after the initial start, Reutzel did encounter a few hazards, mostly in the form of lapped traffic which nearly cost Reutzel his lead. Reutzel’s first, and perhaps his most challenging situation during the 25-lapper occurred on lap 8 when the driver of the Baughman-Reutzel Motorsports entry nearly made contact with a lapped car twice while trying to work around him. Although unable to keep up with Reutzel for the first few circuits, Carson Macedo, who started from the pole position by way of dash victory, was able to chase down Reutzel as the pair encountered lapped traffic. Reutzel’s near-mishap was just what Macedo needed, using his momentum to pull even with the Texan as the duo battled through turns one and two on lap 10. Luckily for Reutzel, the potential lead change was negated after caution flags flew for a slowing Tyler Esh. After the feature’s first and only caution appeared, action resumed with Reutzel still in command of the field over Macedo and Cole Duncan. Periods of heavy traffic came into play once again with less than ten circuits remaining thus allowing Macedo to close the gap once more. Although Macedo made a tremendous effort to track down Reutzel, the former ASCS national champion was just as strong, if not stronger in traffic. Up next on the calendar, the Arctic Cat All Star Circuit of Champions presented by Mobil 1 will conclude the month of July with a four-pack of events across the Midwest beginning with action at Angell Park Speedway in Sun Prairie, Wis., on Thursday, July 26. The four-day, three-state trek will continue at Jackson (Minn.) Motorplex on Friday, July 27, followed by a two-day stop in Iowa where Tony Stewart’s All Stars will invade the world-famous Knoxville Raceway on Saturday, July 28, followed by a stop at 34 Raceway on Sunday, July 29. More information pertaining to the All Star trip west will be published in the coming days. Fans should stay tuned on the Web at the official online home of the All Star Circuit of Champions - www.allstarsprint.com.